We’d love your help. Let us know what’s wrong with this preview of Return of the Bird Tribes by Ken Carey. "Ken Carey is one of the greatest living teachers… Read him, and you'll have hope." 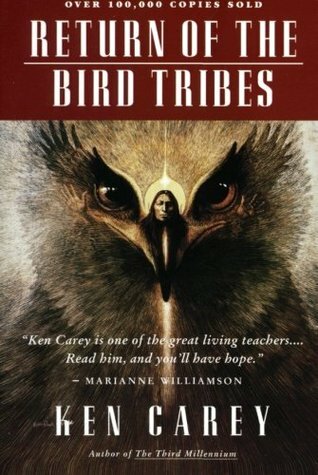 Exploring the transformative impact of Native American spirituality on contemporary events, this is the third book in Ken Carey's bestselling Starseed series, which concludes with The Third Millennium - the book Marianne Williamson calls "a kind of millennial Bible." To ask other readers questions about Return of the Bird Tribes, please sign up. There is a compassionate force in the Universe that comes to us in many guises, including enlightened Native American leaders. This manifestation of God's love describes itself as both angelic and extraterrestrial. There is a review of the history of the human race and predictions about what is to come. Was a while ago I read it. Good wisdom. Fantastic story too, although largely unverifiable. What a beautifully written book! this is a very insightful book full of universal truths, translated into a native american context , i'd say. I found particularly beautiful the explanation of the dual aspect of life- the feminine and masculine aspects of the great spirit, and the unfathomable creative energy that might occur between them, the very same one that has the power to bring entire galaxies into existence! It almost transported me to another time when men and nature were living togethe What a beautifully written book! this is a very insightful book full of universal truths, translated into a native american context , i'd say. I found particularly beautiful the explanation of the dual aspect of life- the feminine and masculine aspects of the great spirit, and the unfathomable creative energy that might occur between them, the very same one that has the power to bring entire galaxies into existence! It almost transported me to another time when men and nature were living together as a sacred one. This was the first Ken Carey book that I read. I have since read every other Ken Carey book that I can find. What more can I say. This book has some fascinating accounts of spiritual wisdom from native american culture. On the whole though, reading the book was tiring and at times frustrating due to the later chapters lacking a natural flow and the constant repetition of ideas. I had to force myself to go back 4-5 times to read the whole book. So glad I finally read this book. It had been on my radar since I read a quote from it on Mystic Mamma. Definitely a treasure trove of wisdom resetting my perspective on the world and my role in it that I’ll be rereading and sharing. A good read. Thank you Ken Carey for transmitting this illumined story. Amazing to turn to this, suddenly and synchronistically, alongside The Keys of Enoch. This is Enoch (and many other great Teachings of Light), condensed, softer, more accessible. Really beautiful. I read the first half of the book numerous times, and just recently finished this book. A beautuful way to use symbolism to point to the deeper truth who h can't be named. This definitely reverberates the sound of being called home to the knowing deep within and takes me further out of the noise of the mind. I want to re-read this book because of the special message that it contains for humanity in this time of our evolution. I don't remember a lot of it - but that it felt priviledged to be reading it - the perspective it gives, Ken Carey is sharing a wonderful gift. very interesting and sorta anthropomorphical... how do you readers like that word!!!??? Ken Carey has been conducting workshops on education and the environment for more than ten years. He is the author of several books, including ‘The Starseed Transmissions’, ‘Vision’ and ‘The Third Millennium’.